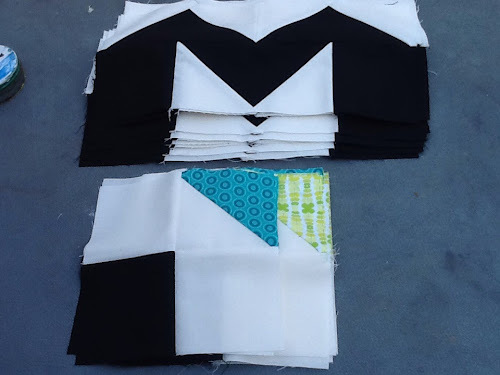 This week's assignment for Melissa's Star Surround QAL was to sew together the pieces that will eventually be the surround part of the block. These pieces went together super easy and fast. But I did have a couple of issues with seams not matching perfectly. When I took all these pieces outside for the "photo shoot", I couldn't resist laying them out with the star centre to see what my blocks would look like. We get to sew everything together into blocks next week. Yay! 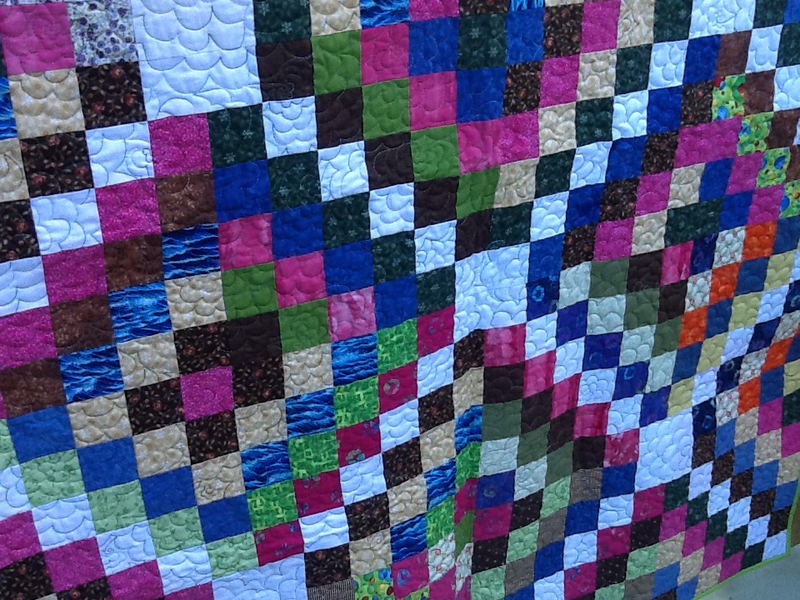 The Montreal Modern Quilt Guild challenged its members to come up with a modern traditionalism project over the summer months. A great number of our members are either new to quilting or new to modern quilting, so this challenge was the perfect opportunity to learn more about modern quilting. So we kept the guidelines pretty loose. All we had to do was to take a traditional block and give it a modern twist. I decided to take my favourite traditional block - the churn dash (or the wrench?) and make it way bigger. 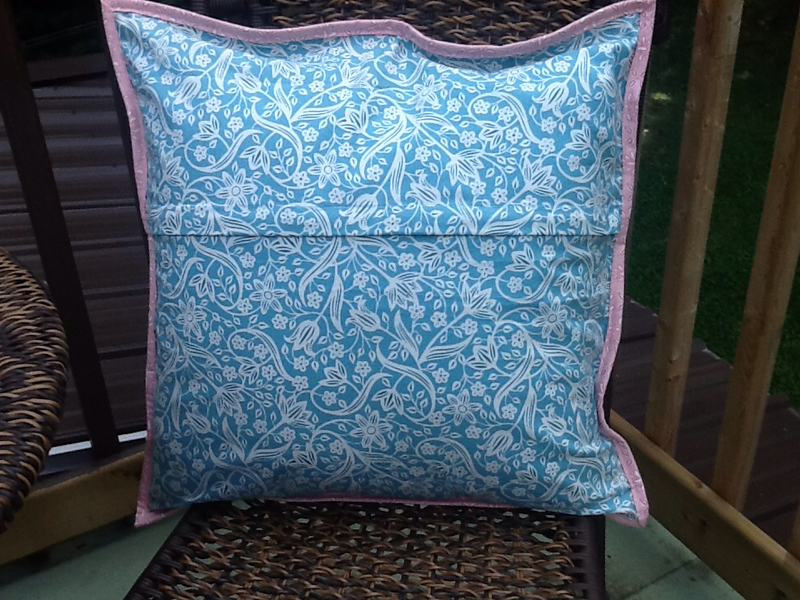 I also used some Veranda leftovers I had and made a pillow cover. 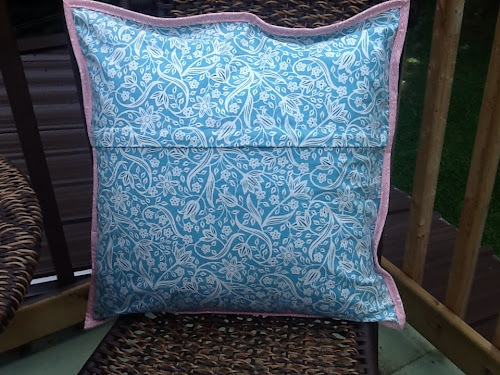 The pillow measures 20" square. 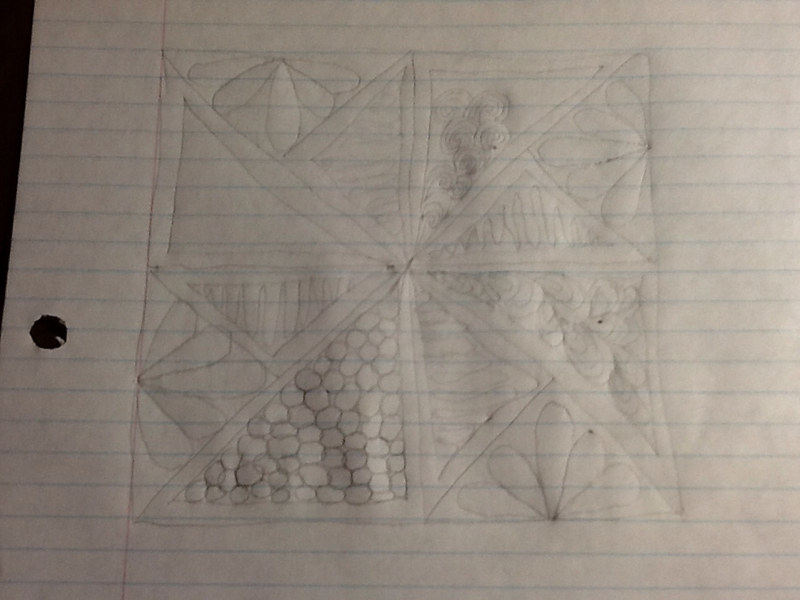 I quilted it with straight vertical lines. So I'm all set for the September Guild meeting and Show & Tell! 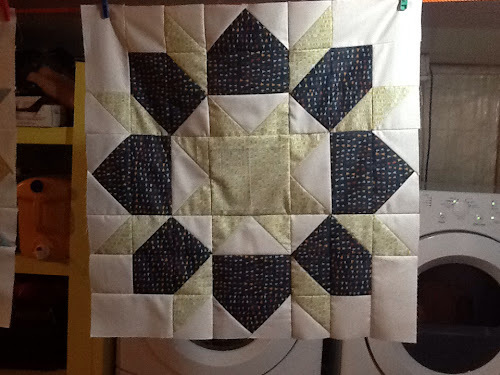 Linking up at Amanda Jean's for Finish It Up Friday and at Sewing by Moonlight who is hosting TGIFF this week. The colours in this picture aren't great. It looks much nicer in person. So now only 1 more block to go! Yay! 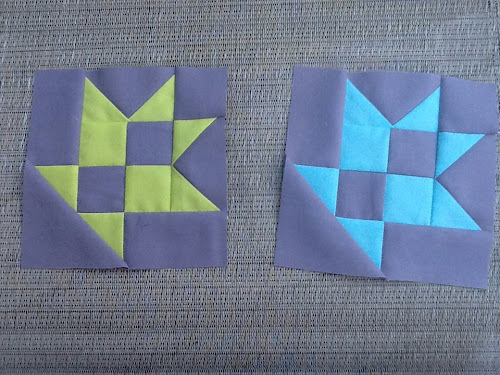 I can't wait to start sewing these blocks together. The other major WIP for me this week is to finish my blocks for this month's Schnibble, Canasta. I sewed 1 more block last night but I still have 23 to make and then have to sew everything together into a quilt top by the end of the month. 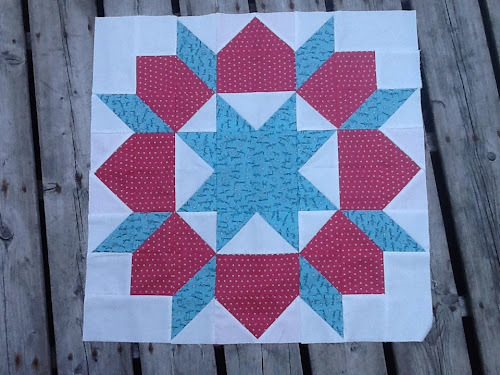 I will be linking up at Lee's for WIP Wednesday. Well, this past weekend has been all about Schnibbles for me. 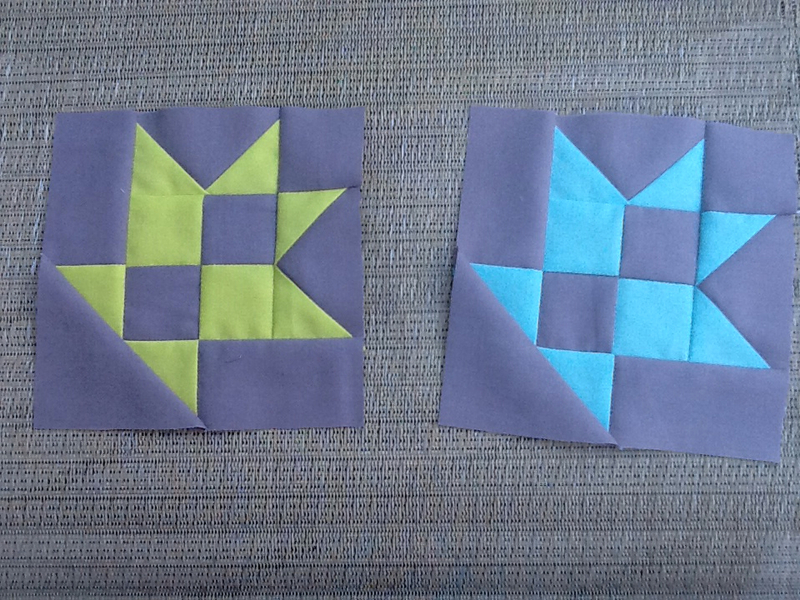 First, I cut all of my charms for the August Schnibble and started piecing the blocks. I decided to go with solids for this one. I'm using Kona cotton in a rainbow of colours. I think it's going to look really cool. 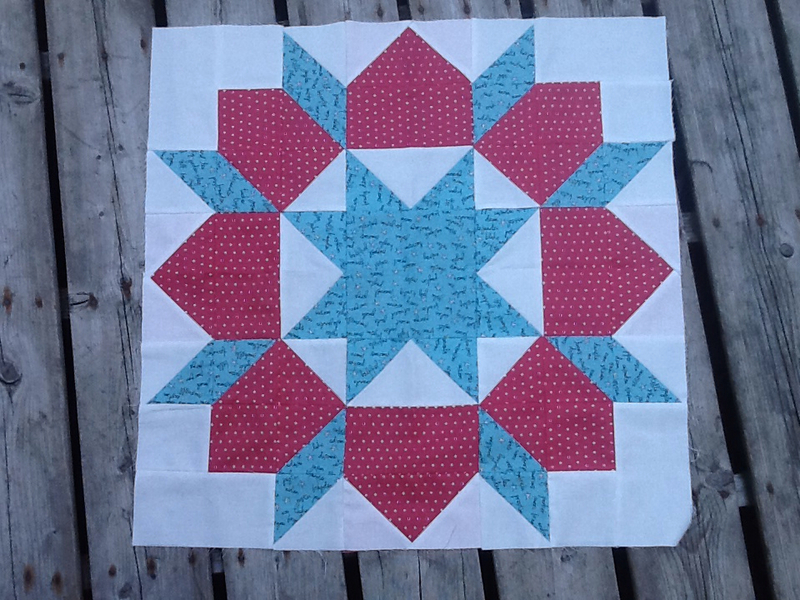 And yesterday, I started quilting Dulcinea, which was the June Schnibble. 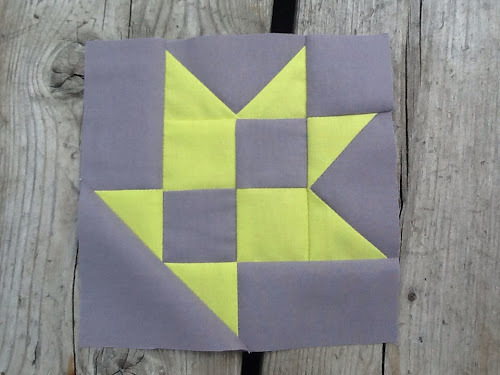 I love making Schnibbles because they are pretty small projects that go together quickly and they are perfect for practicing my FMQ. 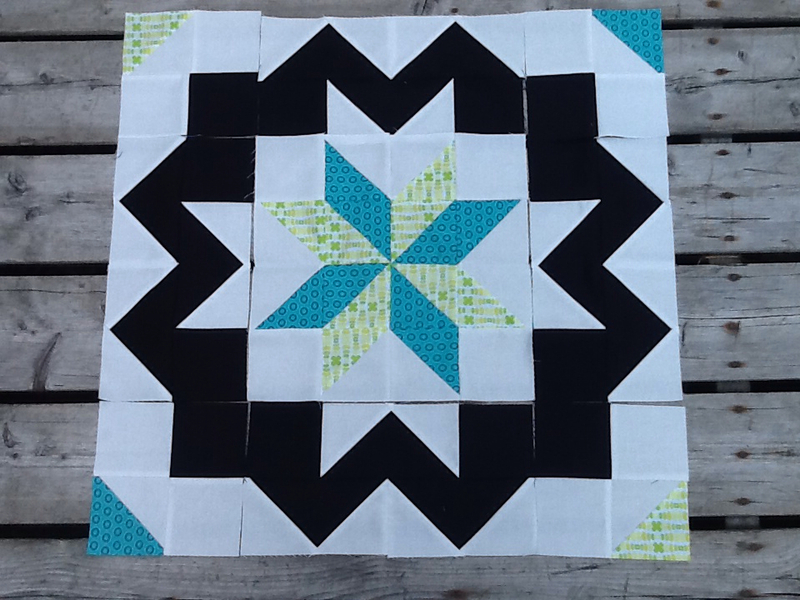 On Dulcinea, I'm doing some echo quilting, some stitching in the ditch and some free motion designs in the white areas and in the border. 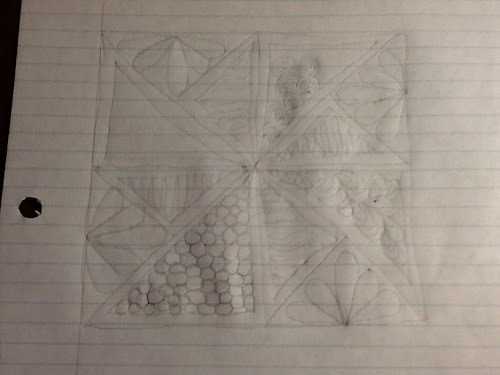 Before I put the quilt on the sewing machine, I "auditioned" a few designs on paper and then just went for it. 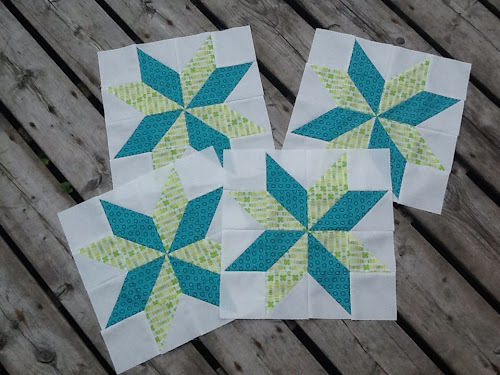 This week's assignment for the Star Surround QAL hosted by Melissa over at Happy Quilting was to sew our star centres together. Aren't they nice? :-). I love the Color Me Retro collection and how the two prints I chose play together. Now I can't wait for next week's assignment! As I mentioned in my last post, I finished quilting my Scrappy Trip top last weekend! Yay! This top was my August goal for A Lovely Year of Finishes over at Fiber of all sorts and Bittersweet Designs so here's to a nice big checkmark. 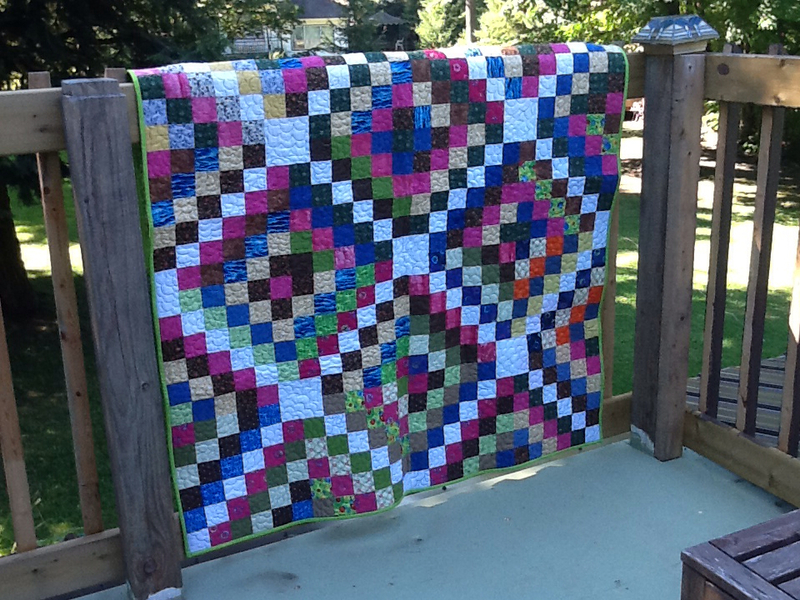 I used 20 blocks for this quilt and it finishes at around 50" x 60". A really nice size for a lap quilt. You can't really tell from the pictures, but I used a green variegated thread for the quilting and quilted a design I learned in Angela Walters' Machine Quilting Negative Space Craftsy class - the flower design. I love it. Super easy to do and it gives the quilt a fabulous texture. 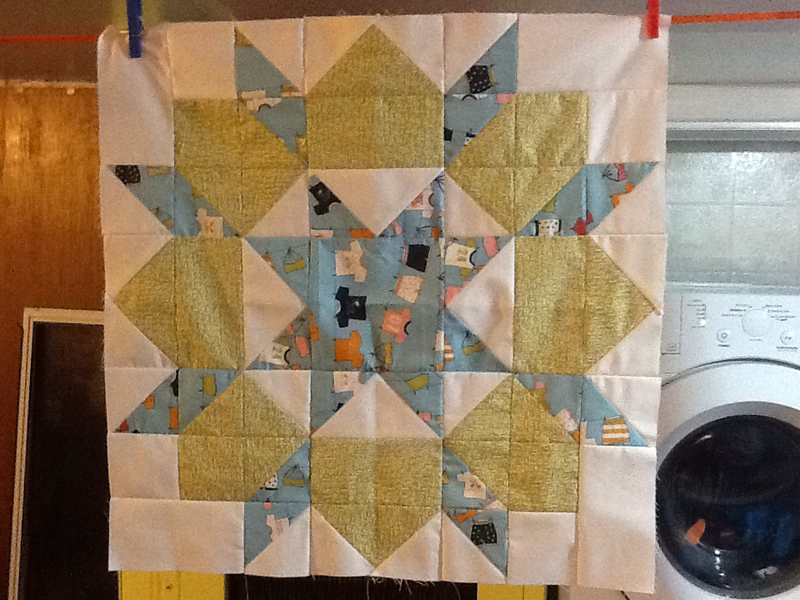 I made the binding with a lime green solid and I think it frames the quilt perfectly. Linking up at AmandaJean's for Finish It Up Friday and at Amy's who is hosting the TGIFF linky this week. I will also be linking up for a LYOF at the end of the month (link in my sidebar). P.S. 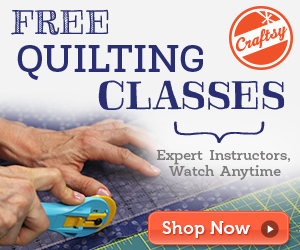 If you are interested in getting more information about Angela's Craftsy Class, click this banner (this is an affiliate link). I'm at the end of a fabulous 2-week vacation and that is why I've been quiet for a little while now. We don't have internet service at the cottage so I haven't been able to blog, read blogs or leave comments. We are in the city for a couple of days this week (school shopping, etc.) so I plan on doing lots of blog reading and maybe even post a couple of blog entries! 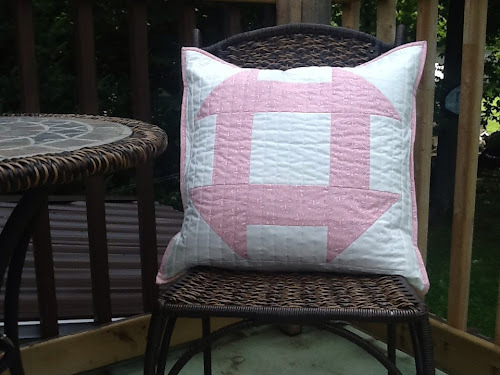 I have been doing some sewing while at the cottage. 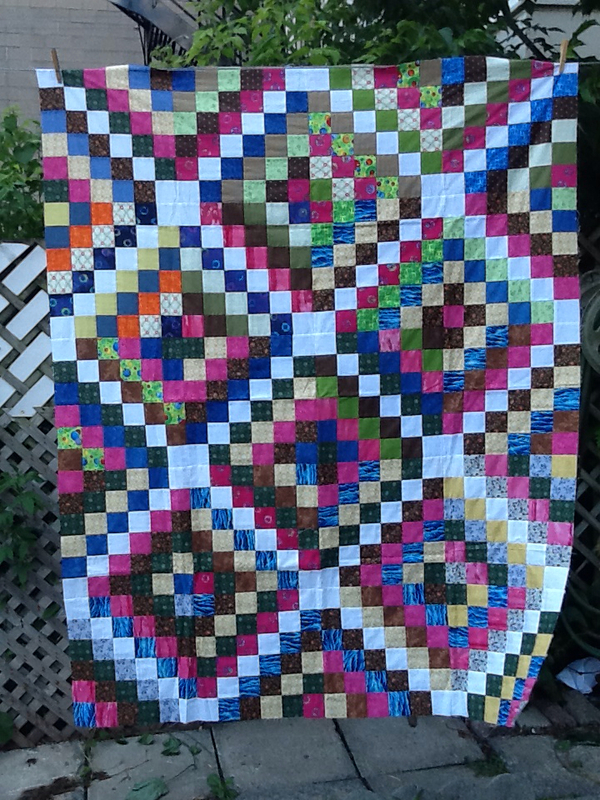 I finished my August LYOF goal and got my Scrappy Trip top all quilted. Photos to appear later this week. 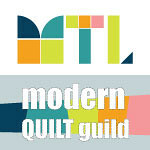 I also finished my Montreal Modern Quilt Guild challenge quilt which I will share soon. I pieced all my Flying Geese for the Star Surround QAL and got started on sewing the centres of the blocks. And I pieced 2 more Swoon blocks for the #swoon2013 QAL. 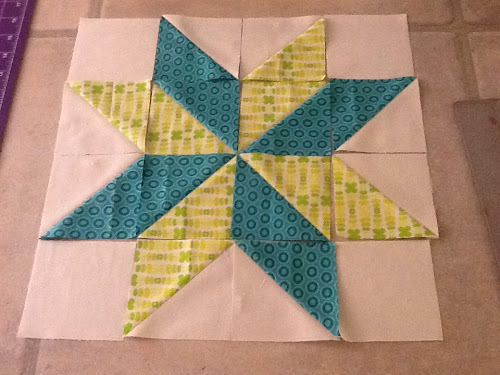 Only 2 more blocks to go and I can start sewing them into rows! 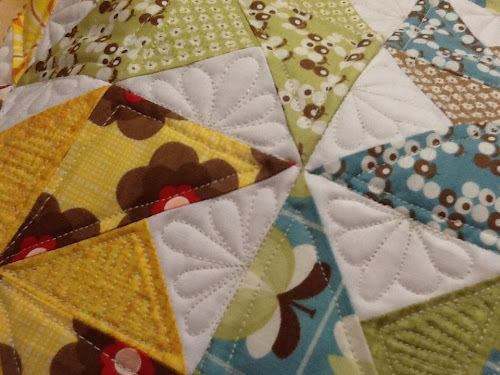 Linking up at Lee's from Freshly Pieced for WIP Wednesday! Check out all the fabulous works in progress by clicking the button in my sidebar. 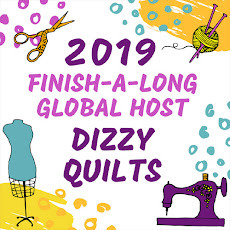 I missed the LYOF July goal setting linky party because I had too much going on and didn't think I would manage to finish anything. 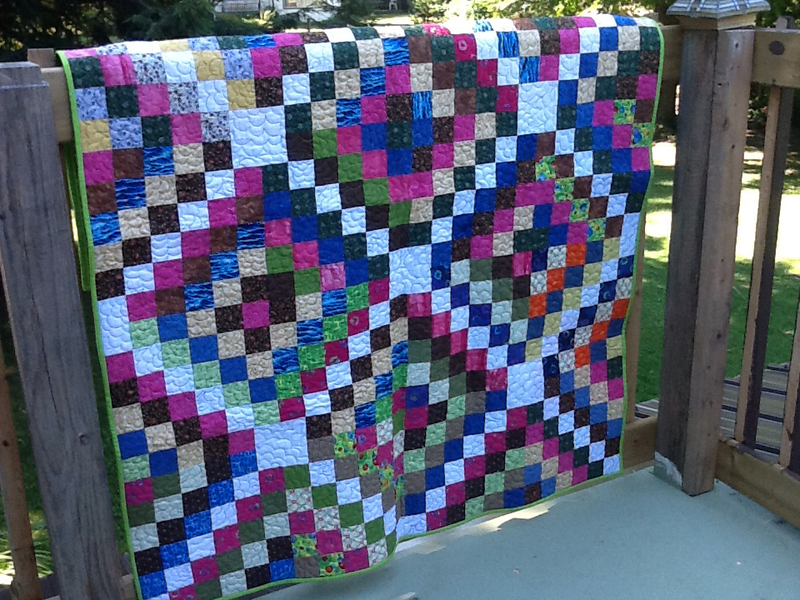 Of course, I ended up finishing Dylan's quilt so I should have linked up, but hey! This month, I am planning on finishing my Scrappy Trip quilt. The more I look at this top, the less I like it. :-(. I don't like the colours, I don't like the fabrics, and I don't really like the size. It's just not working for me at all. BUT, I want to finish it for 2 reasons: I am going to use it as practice for FMQ and I want to give at least one quilt to charity this year and I think this might be it. There are a lot of nursing homes where I live and I'm thinking this would be the perfect size to put on someone's lap if they were in a wheelchair. So there you have it - my LYOF goal for August! Click on the button on my sidebar to check put everyone else's goals.